Hello cyberaditya's visitors first of all thanks a lot for visiting because I am getting unpridicted traffic on my blog within this month only I got the traffic of more than 3417 + visitors..thanks for your support .. In this post we will learn how to know IP(Internet Protocol) address of our computer as well as of the websites we visits. How to know IP address of our computer ? there are many ways to check your IP address of our PC. 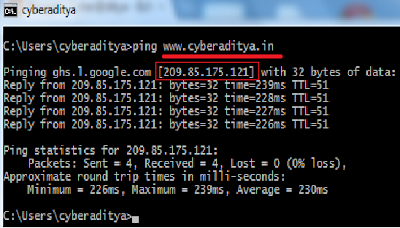 But since our Blog is about simple cyber post so i will share the easiest method to check..
replace the www.cyberaditya.in to whichever site U want to know the IP address. 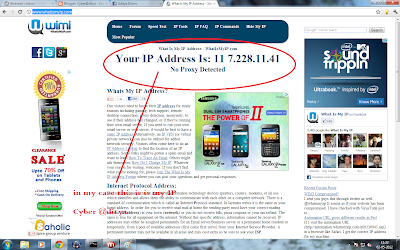 *note* - there are many ways of knowing IP address of any website but I am sharing the Easiest and the fastest way to know.